Travelling with pets is becoming quite popular these days. With increasing number of resorts and hotels offering pet accommodation, pet parents prefer to take their pets along for vacations. They are not comfortable with the idea of leaving them behind in kennels. They would like their pets to have a wonderful holiday too! Most parents prefer to take a road trip, as they find this a convenient way to travel with their pets. However, travelling with a pet can be quite stressful and to overcome this, pet parents can keep a few things in mind, which can make their short or long distance trip, a safe and a pleasant experience. A visit to your vet, few days before you embark on your journey. This will ensure your pet is fit and healthy and can sustain the entire trip. Health care document of the pet must be carried along. Contact details of the vet. Contact number of emergency animal hospitals along the way. Pet must wear an ID Collar and name tag. Microchip would be a better option. Leash must be worn at all times. Safety harness is a good option. Blanket and a pillow of your pet’s bedding. Pet’s food and drinking water with portable eating and drinking bowls. Grooming provisions such as comb and brush. A few hours before your road journey, you must take your pet for a walk and then feed him food and water in small quantity. You should ensure that the air conditioning is on, when you pet gets into the car. You can fasten your dog’s crate to the backseat of your car with travel straps, which are available at any pet store. You may choose your pet to wear a canine seat belt. When stopping the vehicle, good airing must be considered. Windows must never be rolled down and pets should be refrained from putting their heads out.Feed your pet with treats such as biscuits and chews at short intervals. Sufficient food and water supply is necessary, though only small quantities should be fed during travel. Carry a portable water bottle, which can be used when stopping for a break. Stopping at regular intervals for stretching and taking a potty break is suggested. Pets must never be left alone in the car. To make the best of air travel, reservations should be made well in advance. It is advised to be well versed with the pet-travel policies of the airline. Airlines have size regulations for approved pet carriers to fit your pet in the cabin or cargo areas. A general health certificate and vaccination details must be provided within 10 days of departure. All carriers must fit your pet properly with enough ventilation. It is better to opt for a non-stop flight, as this will prevent your pet from anxiety and loneliness. Feed your pet a few hours ahead of travel. Exercise your pet and let them take a potty break, much before catching their flight. Dogs are allowed to be taken in long journey trains of Indian Railways. They are usually kept in a cage in the guard boggy, which is located at the end of the train. All the details of the pets - size, breed and the vet’s certificate need to be presented to the railway authorities before the journey. The charges of pet tickets are different and need to be purchased an hour before the train arrives. 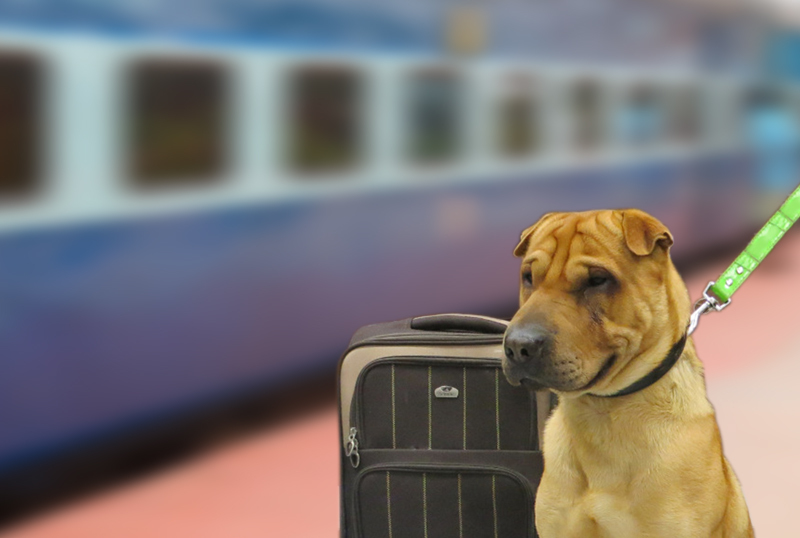 Only one pet is permissible in the train, except in the case of a first class traveller. You should inform the stationmaster about your pet, an hour before the arrival of the train. When the train reaches your destination, the guard will hand over the pet to the parcel manager and the pet parent needs to sign in the register and then take his pet. For more information check "Rules and Rates for Conveyance of Dogs in Indian Railways"
These days many hotels permit pet parents to bring along their pets with them during their stay. Nevertheless, you need to make prior arrangements with the hotel much in advance. You can also surf on the internet on several websites such as bringfido.com, petvacations.in, tripadvisor.in etc, that give out information on which hotels allow pets in their premises. When you call to make your reservations, you need to ask ideally the kind of accommodation available for your pet. You may like to stay at a hotel that also provides day care and walking services for your pooch. You can research the hotel's website for more detailed information on these areas. By staying in a hotel that efficiently covers your dog's need, you both will be able to have a pleasant vacation and an experience of a lifetime! Travelling with your pet should be comfortable and to achieve this, you will need to do your homework well in advance.